While I was in Miami last weekend, I spent the majority of my waking hours laying around by the pool with my nose buried in Ruth Reichl's memoir of being the NY Times restaurant critic, Garlic and Sapphires. I finished it in two days flat, and when I was done, I felt a little wistful, as though a part of me regretted having gone through it so quickly. Needless to say, I loved it. The way Reichl describes food is second to none--she makes you feel as if you're right there with her taking the same bite of handmade soba, or foie gras and strawberries, or as in the dish I've made here, the creamy, peppery scalloped potatoes she includes in a special dinner for her family. Preheat the oven to 350 degrees. Rub a 9 x 12-inch gratin dish all over with both halves of the garlic clove. Grease the dish with the pat of butter. Slice the potatoes as thinly as you can and arrange them in a layer, overlapping the edges slightly like shingles. Sprinkle the potatoes generously with salt and freshly ground pepper, and a third of the cheese. Repeat this process with your remaining potato slices. Depending on how thinly sliced your potatoes are, you should end up with approximately three layers, with a third of the cheese between each layer. Reserve the last third of your cheese for later. Carefully pour the milk over the potatoes. It should come up to the bottom of the top layer of potatoes; add more if this is not enough. Dot the top of the gratin with the three tablespoons of butter and bake it for about an hour and 15 minutes, taking it out of the oven every 30 minutes to press the top layer down gently with a spatula to keep it moist. Sprinkle the remaining cheese on top of the gratin for the last 15 minutes of baking. 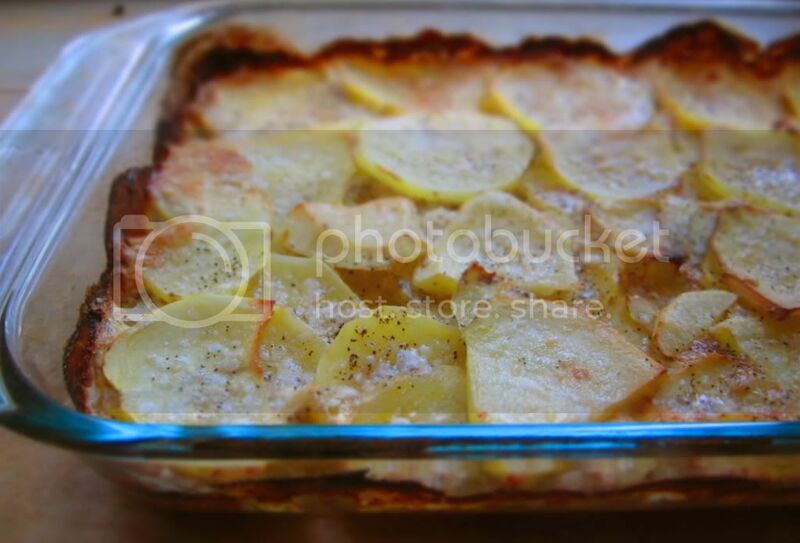 The gratin is done when the potatoes are soft and the top is golden brown. Let the dish sit for about 10 minutes before serving. I love me some scalloped potatoes. I need to make this soon! I will definitely save this recipe for my next fancy dinner. I love scalloped potatoes... what a great comfort food. I decided to use heavy cream instead of milk like Ruth Reichl did in her original recipe (I know I know but I just wanted to try it - will stick to milk next time and probably skim). Added a few pieces of prociutto between the layers and cut back on the salt. Sooooo Gooood!